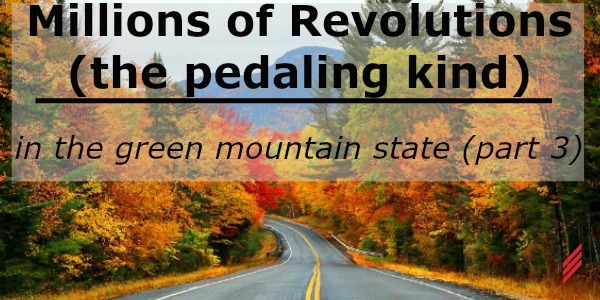 In my last blog, I described the progress made through 2017 on my quest to bike all the paved roads that appear on the Vermont Official Road Map. This second quest came on the heels of my first that began in 2010 to ride some part of the roads in each of the 251 Vermont towns and cities. In the current quest, the paved roads are all those on the map other than the limited-access segments which bicycles are prohibited from riding and by my estimate totals around 6,000 miles. In my next two blogs I’ll update you with my 2018 spring progress with towns completed, miles ridden, elevation climbed, eateries experienced and trivial information learned in the course of researching my road observations. By the end of the 2017 riding season I had roads to ride in 40 of the 251 towns and cities before I could put these remaining towns in the completed column and call my project complete. At the start of the 2018 riding season I realized the correct count was actually 39 as the small town of Baltimore that I had been including actually has no paved roads. April in Vermont was cold and wet and not the kind of weather I wanted to resume riding for any length of time in. 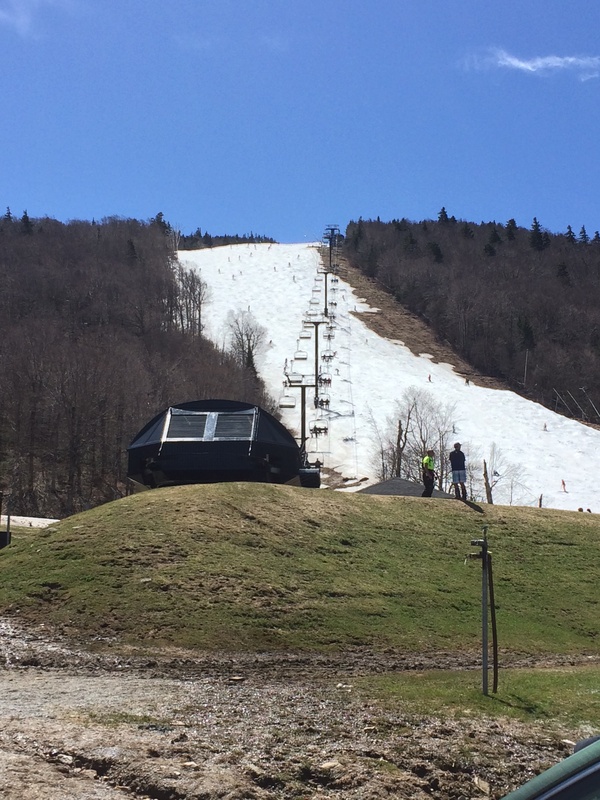 May was a different story and the combination of warm weather and the itch to get back to serious riding after the winter break led to a strong jump start. 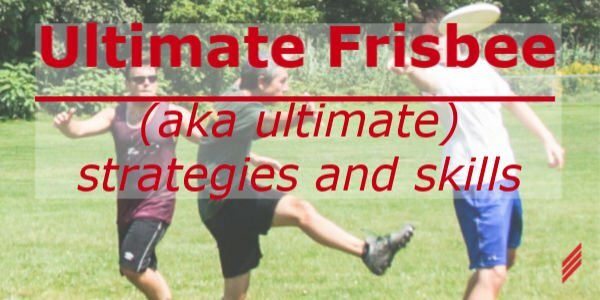 With an eye out for good weather forecasts I took a few vacation days from work and a couple of weekend days to ride for this goal. With Cindy supporting, I completed the remaining roads of 18 southern towns over 5 days totaling 312 miles, climbing about 19,000’ total, and riding for a little under 23 hours. This pace of progress was only possible with that support as I was able to string together roads in the same vicinity and then rack the bike to have Cindy drive me over roads I had previously cycled to the area of the next group; some days racking and re-launching 4 or 5 times. The first ride on May 2 was in Windsor County along the Connecticut River with daytime highs in the mid 80’s. I completed the towns of Hartland and Windsor except for the Mt. Ascutney State Park road, as well as parts of Weathersfield and Springfield. I left the Mt. Ascutney climb for another day later in the riding season when my legs would be more seasoned. The days riding included three crossings of the Connecticut River and the VT/NH border at Springfield, Ascutney in Weathersfield and Windsor. My ride began at the start of pavement on Eureka Road at Springfield’s northern border with Weathersfield. Heading south I noticed several old looking historical markers marking former early settlement structures and sites. At the intersection with Route 143 I headed northeast on that route to the intersection with Route 5 where I resumed riding south again along the Connecticut River. Along this route an old granite post roadside marker carved with “CROWN POINT ROAD 1760” caught my eye. My first thought was that there must be another Crown Point in the area to the one I’m familiar with which, is on the opposite side of the state in New York, just across Lake Champlain. Post-ride research informed me of the former Crown Point Military Road built in 1759-1760 during the French and Indian War. This road was built to move supplies and troops between the fortress at Crown Point, NY, then under construction, with Fort No. 4 in what is now Charleston, New Hampshire to the east of Springfield. I have never noticed other markers for this old road in my travels and I apparently simply missed quite a number of them where the current north-south roads cross this former east-west road. Much more information about the history of this road and the locations of these markers can be found at https://www.crownpointroad.org/home/maps/. As others have done, there’s a possible future project for me in researching the location of these and heading out on the roads to discover them. The Crown Point Road spawned new settlements and one was the village of Eureka in the northeast district of Springfield where I had noticed the historical markers at the start of my ride. The Eureka School House which was constructed between 1785 and 1790 and closed in 1900 was moved in 1968 to a new location on Route 11 near the I-91 interchange. 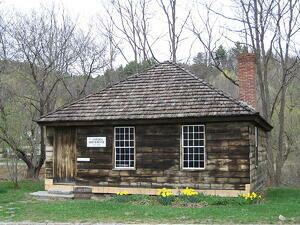 It is the oldest one-room schoolhouse in Vermont and open to visitors looking to take a few steps back in time. After lunch in Windsor, my ride resumed with my third crossing of the Connecticut River for the day, this time over the Windsor-Cornish covered bridge which at 460’ is the longest covered bridge in the U.S. It was constructed in 1866, consists of two spans, and is of the Town Lattice design after architect and civil engineer Ithiel Town who patented the design. It’s a simple design but amazing considering the length of spans achieved with wood construction. 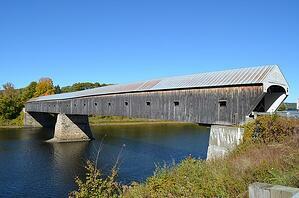 Like many of Vermont’s covered bridges it has stood the test of time. My next blog will share with you my progress on four additional days of cycling through southern Vermont. 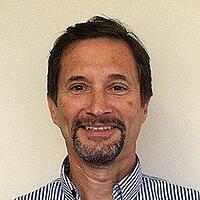 Chuck is a Senior Mechanical Engineer and Project Manager for Hallam-ICS’s with nearly 40 years of experience. His career at Hallam-ICS commenced in 1984 after having started in the consulting engineering field in 1978. Chuck has an Associate of Applied Science degree in Architectural & Building Engineering Technology from Vermont Technical College. Chuck is a licensed Professional Engineer in Vermont, New Hampshire, Maine and North Carolina and is a member of ASHRAE the American Society of Heating, Refrigerating and Air-Conditioning Engineers. Chuck has experience in mechanical, plumbing and process systems designs for the commercial, institutional, industrial markets.